Satellite images appearing to show hundreds of Russian tanks just 11 miles from the Ukrainian border have emerged ten days after President Petro Poroshenko warned that Moscow is scrambling its army on his doorstep. 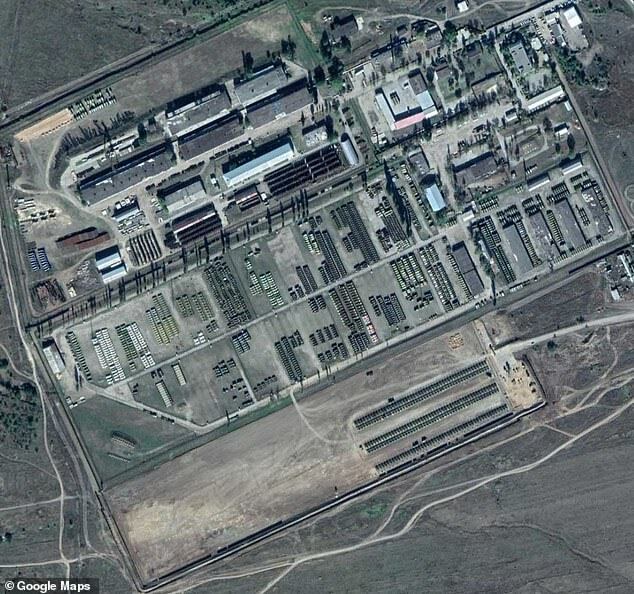 The images were reportedly taken by Google Earth satellites last month, and shows the Russian military base in Kamensk-Shakhtinsky, near Ukraine's eastern border. 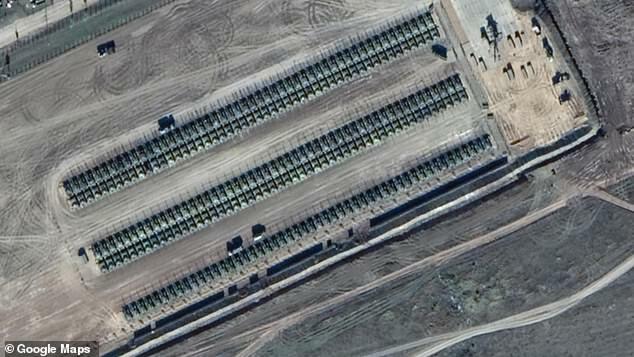 Last month, President Poroshenko showed satellite images of the same base, which indicated that more tanks had arrived in recent months. 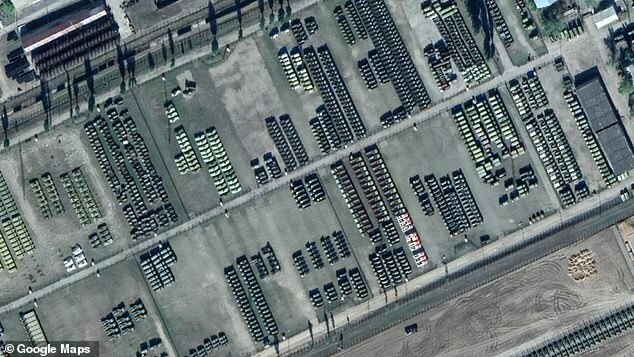 The new satellite images show around 250 T-62 battle tanks and around one thousand military trucks, artillery systems and tankers at the base, according to the Defence Blog. 'This is 18km from my border, this is the same warehouse where they have their ammunition, the same where they have multi-rocket launch systems, we should be prepared to protect my country,' Poroshenko told Sky News. Poroshenko has previously accused the Russian President of wanting to 'annex' all of the Ukraine. This comes as the EU's foreign ministers meeting said they would look at offering more assistance to Ukraine as they meet in Brussels this week. The ministers discussed with Ukraine's Pavlo Klimkin 'the latest developments in the Azov Sea but also, and mainly, the support of the European Union to Ukraine, to Ukrainian people, to territorial integrity of the country', said the bloc's top diplomat, Federica Mogherini. The bloc later added nine rebel politicians from the Donetsk and Luhansk regions of east Ukraine to its blacklist as a follow-up to the separatist vote there, bringing the total number of people barred from the EU over turmoil in Ukraine to 164. Those blacklisted include Leonid Pasechnik, named mid-November as the rebel head in Luhansk. His Donetsk counterpart, Denis Pushilin, was blacklisted in 2014 as one of the initial leaders of the Russia-backed revolt. Any assets they have in the bloc are also frozen, as are those of a further 44 entities. Kiev has called for more Western sanctions against Moscow after Russian patrol boats fired at Ukrainian navy ships in the Azov Sea off Crimea. But the divided bloc is not going to act swiftly, if at all. The 28 EU national leaders, who meet for a summit in Brussels on Thursday and Friday, are, however, due to decide to extend the bloc's existing sanctions that target Russia's defence, energy and banking sectors. Germany's Haiko Maas said the situation in the Azov Sea remained unresolved as Russia was still holding the Ukrainian sailors. Berlin and Paris were seeking to ease tensions between Moscow and Kiev. Fighting between Ukraine and Moscow-backed separatists in eastern Ukraine has killed more than 10,000 people since 2014 and small-scale but deadly exchanges of fire are still frequent. Citing the Russian threat, Ukraine in November introduced martial law and banned Russian men of combat age from entering the country. The EU has since released 500 million euros in financial assistance to Kiev but is split on whether to go ahead with any new economic sanctions, a move that would require unanimity of all 28 member states. 'We don't see yet any decision-making today on the table,' Austria's Karin Kneissl said when asked about more sanctions against Moscow following the sea incident. On the other side of the spectrum is Lithuania, a leading EU hawk on Russia. Foreign Minister Linas Linkevicius said the Azov Sea standoff was a 'blatant violation of international law' by Russia and could not be left unanswered. 'I don't expect something to be decided today but sanctions relating to this topic must be on the table,' he told journalists.